When Microsoft first touted the educational muscles of HoloLens at a Windows 10 event back in 2016, my mind immediately leapt to an episode of The Simpsons in which Lisa imagines a history lesson with a virtual reality headset. This wasn't some kind of rare occurrence for me – I experience roughly three callbacks to the show a day – but it still stuck in my mind. When seeing volcanos erupting and Minecraft being projected through a headset, it felt like the future, in a way, was kind of here. And that's because when I first watched the clip as a child, we were still years away from smartphones, never mind sitting through an interactive experience involving ancient civilizations. Now nearly 25 years after the writers of the show did what they've always done – predict the future – it finally feels like virtual and augmented reality are on the cusp of becoming a very real part of the classroom. And it's Microsoft, showcasing its latest wares at Bett 2018 in London, that's at the forefront in creating this shift from worn-down textbooks and battered 3D models to interactive experiences in headsets. "Education has always been important for Microsoft," Dan Ayoub, Microsoft's general manager of education tells us. "And, you know, last year we were showing off a couple of things and just introducing this stuff, but recently it's something that's really started to grow and gather pace. And we feel the potential is pretty limitless. "Right now we're showing off historical tours on the Windows Mixed Reality headsets and full classes through HoloLens, and these kind of things are a great showcase of what we can do with this technology." At the company's crowded stand, I put on the HP Windows Mixed Reality headset and prepared to find out for myself. After putting a pair of headphones in and adjusting the set to my bleary eyes, I was transported to Rome through HoloTour – an app that plants you in what's essentially a video version of Google Maps, letting you interact with landmarks and listen to a voice guide. After a quick dive into the history of the Piazza Navona and its famous Fontana del Moro, I quickly warped to the Pantheon, as the guide continued to talk through the history of the space around me. If I wanted to hear more as I passed through, all I needed to was point and click. You can even take yourself to the skies in a hot air balloon (just don't look down through the glass floor like I did) and learn about the city from above. It's intuitive, it's quick, and above all it's immersive. And that's not necessarily down to the controllers (another demo, which sees you act as a surgeon, very much is). It's also very versatile. Creating varied programmes, Ayoub says, is the key to this technology being adopted on a large scale. 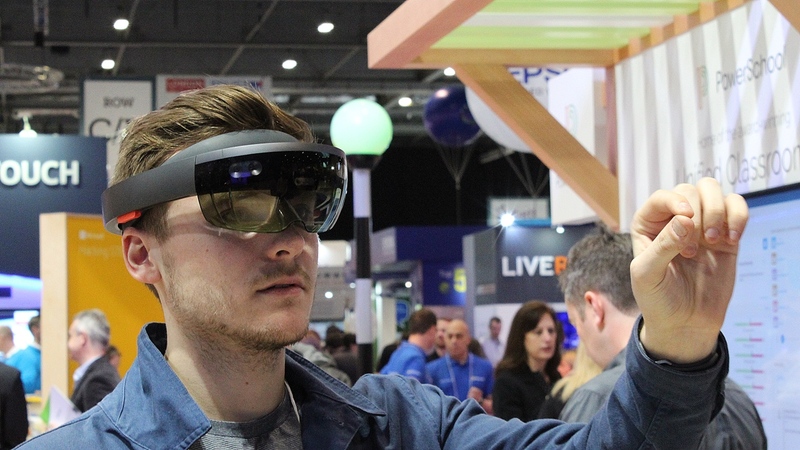 But while the closed-off experience of the Mixed Reality Headsets are great for the kind of programmes outlined above, in which students could stay rooted to the spot, you also have the powerful arm of HoloLens in order to get people out of their seats. Read this: Augmented or virtual reality – which is the future? Whether it's through a lunar eclipse or a 70-minute lesson about human anatomy, the AR headset allows you to walk around and experience models in a way that just isn't as comfortable or natural in virtual reality. Pinching your fingers allows you to navigate, rotate and zoom into 3D images being projected in front of your eyes, and it all adds to an experience that feels like a step ahead of what else is being offered in the space. "What I always say to people is that these are two devices that are great at different things," Ayoub said. "It really depends on what's being taught, and there's some things – take HoloTour as an example – that some may find more immersive with the closed off nature of VR. " But while it's one thing to demo this kind of technology to show floors, having it as an aid in classrooms across the world is another step entirely. "How long is it going to take? It's really hard to say," Ayoub laughed. "We hope things are adopted as soon as possible, and obviously we're already seeing a lot of that in higher education, which is encouraging, but we want to get this technology in the hands of teachers, students and as many people as we can and let them immerse themselves in it." Creating fun apps, above all, is the aim here. And wisely, Microsoft's not trying to do this on its own. This month it joined forces with the world's largest education company, Pearson, as well as public radio station WGBH's Bringing the Universe to America's Classrooms project, which will bring space science to the classroom. But there's also the elephant in the room here - the cost. Windows Mixed Reality certainly acts as a nice pit stop on the route to HoloLens, but its capabilities, as Ayoub noted, are different in an educational setting. One of the hopes the company has is that this kind of technology begins to pay for itself. For example, instead of travelling to receive education, it could be used as a portal for distant learning. Couple that with the recent move to begin offering discounted academic pricing for schools, and there's no doubt it's slowly becoming more viable to buy into the tool. Along the way, as more competitors enter the space, the technology will almost certainly begin to come down in price, too. The bottom line is that education has never been closer to getting rid of traditional methods and embracing new ways to engage students – whether that's in elementary schools or higher education. Microsoft has by no means solved the puzzle just yet, but it's closer than any of the big players to merging the two worlds together in a realistic and varied way. And not even The Simpsons can predict what the next stages of its jump into education will entail.